I’ve been intrigued by Memory Foam Pillows ever since I developed a bad back and neck several years ago, so when I was asked if I’d like to try one out by Bedstar, I jumped at the chance. These pillows sell in a pack of 2 for £60 on the Bedstar website. 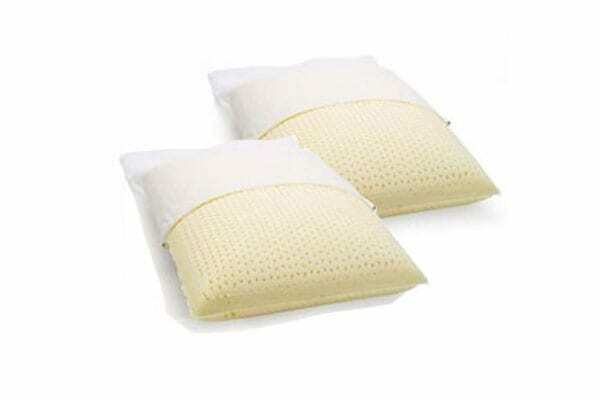 With a Memory Foam pillow, the memory foam clusters which form the core of the pillow conform to your shape, giving the same support as a standard pillow but with the added benefit of being heat sensitive too. I was really looking forward to testing it out, and envisaged a soft, moulding kind of pillow that retained its shape and was soft and cool. In fact, I had to fight off Mr Demolition when deciding who was going to try it out first. I know, I need to get out more! However, on this occasion, the pillow really didn’t live up to expectations. We both tried it out on separate nights but I’m afraid this particular pillow really wasn’t as comfortable as I’d hoped. Normally I sleep with a good quality feather pillow that moulds to my neck, yet offers the firmness and support that I need. I really did think the Bedstar pillow would be like this and much better in fact. It was very firm, just as I’d expected but really didn’t seem to have a foam feel at all. It didn’t seem to mould to my shape and was so uncomfortable I had to revert to my old pillow half way through the night. I guess I’d liken it to lying on a pile of towels, firm with no real give. Mr Demolition gave it a go the following night and found the same, although he did think he felt much cooler on the memory foam than on his regular pillow. Now, perhaps the pillow was just too firm for us and would be fine for others, but I have to say, there isn’t anything in the information on the website that indicates this. It appears to be a ‘one size fits all’ type of purchase which is a shame as it’s always difficult buying something over the internet without the chance of a trial. So overall I would say we’re quite disappointed with these pillows, and at £60 per pair you’d want to be sure you were getting something that would really do the job. I’d love to know if anyone else has tried memory foam pillows and has a good experience. Or maybe you’ve experienced something similar? Pop me a comment below and let me know. I got a couple of memory foam pillows sent when we bought our epic memory foam mattress. I LOVE the mattress so was hoping for a good experience. but like you I found them to be really uncomfortable and hard. My husband still uses his occasionally, but it’s not a patch on my feather pillows. Aah, interesting that you’ve had the same experience Steph. Was so disappointed, and I agree it’s not a patch on my feather pillow.